There are two fallacies that have infiltrated their way throughout society that I hate with every fibre of my being – The “God of the Gaps” fallacy and the “Balance” fallacy. These two fallacies are some of the more destructive logical fallacies that have been spewed forth by the population. I don’t understand how evolution works therefore “God did it”. Actually the guy is trying to discredit evolution by using fail logic which would work better if he actually knew how evolution worked. Berkeley University has a great free course in how evolution works. 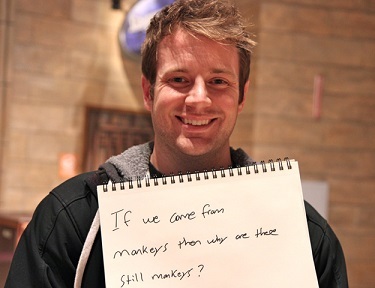 We didn’t “come from monkeys” we share a common ancestor with African apes. It’s a common misconception that we “come from” monkeys – you “come from” your parents. Your parents combined DNA and had you. You share a common ancestor with your cousin. Evolution isn’t a straight line or a linear progression – it’s similar to a family tree. Experiments show that simple molecules such as amino acids can arise spontaneously providing they have the right conditions and these condition have existed on early Earth. “Bada was revisiting the famous experiment first done by his mentor, chemist Stanley Miller, at the University of Chicago in 1953. Miller, along with his colleague Harold Urey, used a sparking device to mimic a lightning storm on early Earth. Their experiment produced a brown broth rich in amino acids, the building blocks of proteins” (source). We’ve got a few others ideas as well. “The good thing about science is that it’s true whether you believe in it.” – Neil deGrasse Tyson. I don’t really have a come back to this except please buy some of these: your brain will thank-you. The Earth rotates on its axis every 24 hours (according to the modern calender), making it look as if the sun appears to move across the sky – which we all know is false. We rotate around the sun, not the other way around. We already know how a sunset works. Physics already has that covered. The colours emitted from the Sun are caused by light scattering. Light is both a wave and a particle and each color of light travels at the different speed to Earth. At sunset, the angle of Earth and the Sun is such that the light has to travel further through our atmosphere to reach your eyes meaning the lower the Sun is the further it takes for the light to reach you because it has further to travel. As the Earth rotates away the shorter wavelengths scatter leaving behind only the wavelength that takes the longest to reach your eyes – the red wavelength, Red has the longest wavelength of visible light, that’s why the Sun usually looks red when it’s right on the horizon – it’s the only colour that can make it through all the haze of Earth’s atmosphere at that extreme angle. I’m guessing he means Austrolopithecus afarensis or Lucy as she is referred to by the media. Scientists have found numerous specimens from Lucy’s species, not to mention other species that share some of our DNA. Science isn’t a theory, it deals with theories – It is a method for understanding the world. It uses testable, observable and repeatable data and experiments to come to conclusions. The definition of theory and scientific theory is being mixed up here. A scientific theory is a well-supported collection of statements including observable phenomena expressed as quantifiable properties, together with scientific laws that express relationships between observations of phenomena. A scientific theory is constructed to conform to available empirical data about observations, and is put forth as a principle for explaining said phenomena. A theory can be adapted to conform to new evidence as it is discovered. In simple terms science is always updating its information as new information is found to more accurately reflect what is going on in the world. Theories that are used everyday (the layman version of a theory) are based off of your opinions sometimes without evidence and can be based on life experience, emotion or a hunch. A non scientific theory can be created without evidence based on the limited information a person can have about a situation. Creationism and intelligent design are not scientific theories – they are stories written in a book that has no evidence to back it up but hundreds of years of monotheistic religions slaughtering people who dare question it. It is not science and should not be in science class. If you wanted to put it in a class devoted to the various literature on origin myths, feel free to do so but it doesn’t belong anywhere near a science classroom. Quite easily because science is paving they way for a more comprehensive answers to life’s questions than “God did it“. Monotheistic religions promote the idea of a creator that owns us and has created us for the express purpose of ruling us. Monotheistic religions promote the God of the Gaps fallacy to continue to have control over us so we don’t start asking questions and finding answers that will lead to the downfall of that control. Religion wants you content with their answer – which is different depending on which religion you are born in to. Religion attempts to keep us satisfied with not understanding the world. I will never be content with “God did it” because time and time again science has shown as there is more to life than wasting your time serving a creator whose function is too limit your knowledge and keep you ignorant.